Lounge 2 luxury spa is an ideal compact home spa with modern sleak outer looks, well designed interior for seating comfort and equipped with all quality functions a premium outdoor spa may offer. 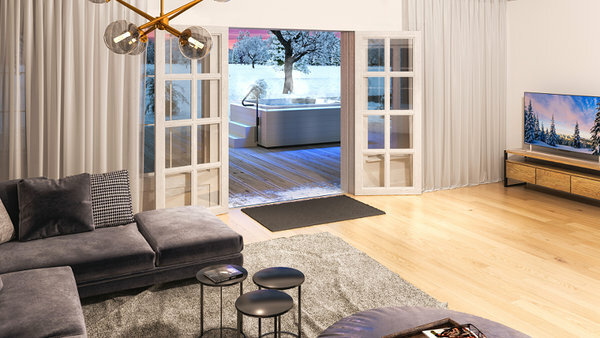 Lounge 2 comes with two lounge seats and two additional seats providing for the most relaxing hydromassage experience, colorful waterline mood lighting for enjoying bathing outdoors during any season. 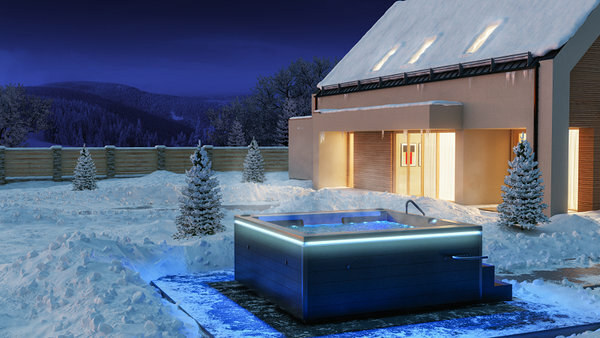 In addition to standard spa functions, all Lounge serie spas are equipped with a unique exterior LED lighting system offering a magical light source for a terrace or garden while using the spa. Elegant design of a spa and finishing that blends with the surroundings of the installed spa are equally important. Lounge series offer wide choice of finishing options as spa paneling is offered both in quality natural wood and composite finishing. Natural wood paneling has its benefits of natural look and virtually unlimited finishing options. You are able to choose from our standard wooden panel finishing or have it custom toned that perfectly matches terrace or house finishing color. Maintenance free composite panelling with UV protection is the most durable panelling material for all-season outdoor exposure for many years. Wellspa offers brown and grey composite paneling. At Wellspa we value skills, experience and dedication that deliver personal touch to every detail of a spa. 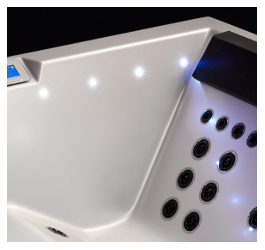 That is why our tailor-made spas offer more customisation and higher quality than of larger productions. 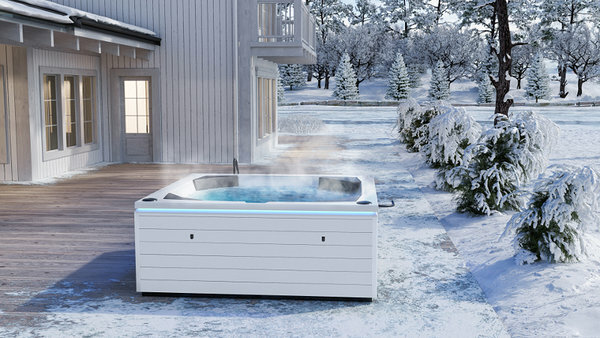 Traditionally we have been engineering and manufacturing spas for demanding Scandinavian weather conditions. Since harsh conditions demand choice of higher quality materials, better durability and higher efficiency, we offer more value and reliability than most. All our spas are handmade by well-trained craftsmen with years of experience of building high quality spas. Every stage of production is well controlled, tested and recorded and all spas pass rigorous functional and safety testing before delivery. Wellspa pool designs incorporate a unique combination of ease of use, the best materials, elegant looks and innovation. Minimalist timeless design of Lounge spas blend well with variety of architecture. 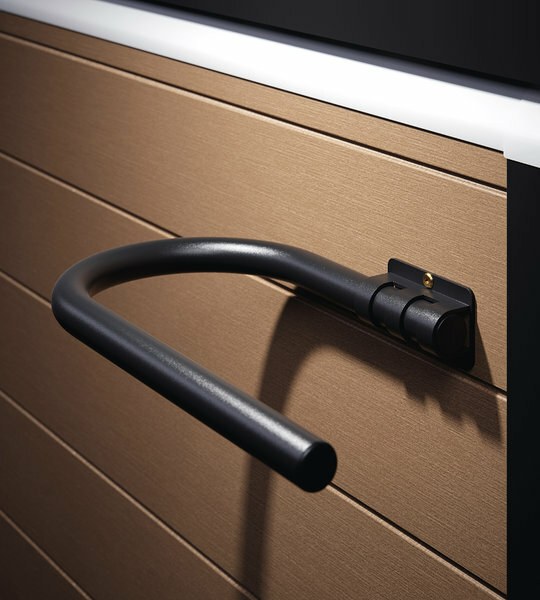 The modern outer look with straight lines provides for virtually unlimited possibilities of the spa cabinet finishing and easier spa installation into any location - whether built into a terrace, placed next to a house or to the garden. 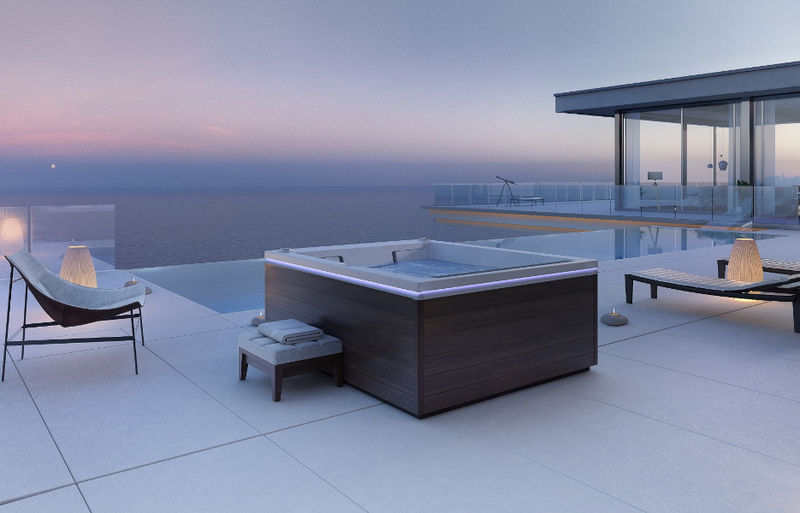 Lounge spas were designed keeping in mind that user expectations include in addition to uncompromised functionality, durability and energy efficiency also modern design. Classic spas have wooden cabinets and rounder form. These two elements give the pool a more massive and classic look and form. The cabinet is made of especially durable Siberian larch. 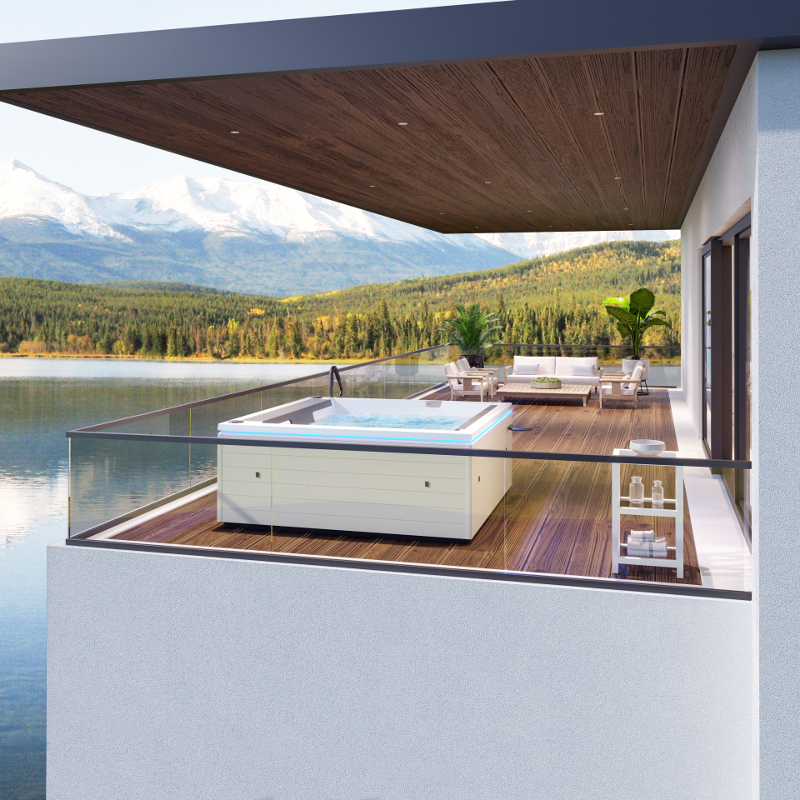 As a unique option we offer an almost limitless finishing possibilities for the natural wood cabinets of the Classic outdoor spas. You can stain it or paint it according to RAL-codes to make the outdoor spa fit perfectly with the finishing of the terrace or the house. The unique exterior LED lights on the outside of the outdoor spa create a magical illuminated area on the terrace around the spa or in the garden while in use. However, they can also be used as a stand-alone decorative light source. For creating a very special atmosphere the magical LED exterior lights are available in multi-colored RGB or warm white tones. RGB lights are synchronized with the inner waterline lighting, the white exterior LED lights are available separately with on/off remote control. The multi-colored RGB LED-lighting on the waterline in the spa brings chromotherapy to the user and creates a truly relaxing atmosphere. 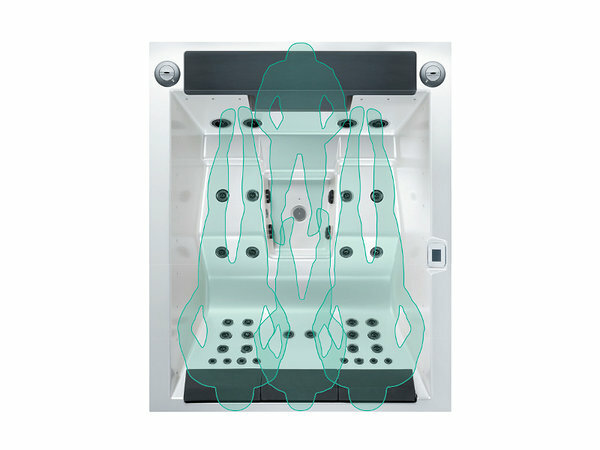 In buying extra convenience equipment you create an ideal environment for achieving the best feeling. Waterproof music system allows you to enjoy your favorite music with your smartphone. The music system consists of two waterproof pop-up speakers, Balboa Bluetooth receiver (amplifier) and subwoofer. Receiver is equipped with a USB interface. 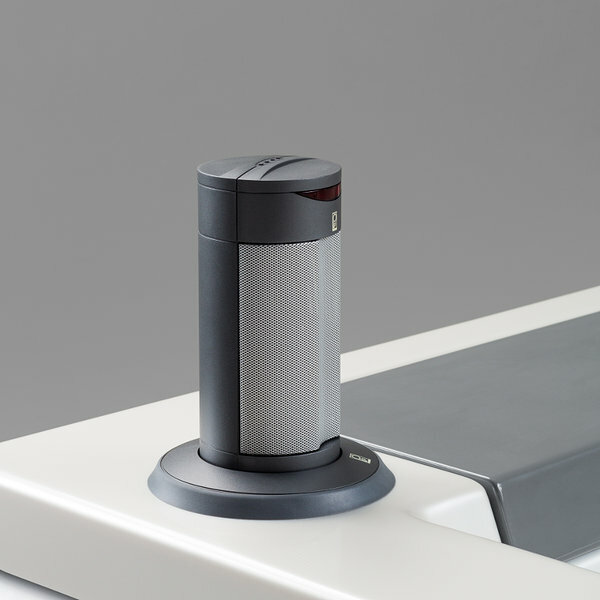 Outdoor spa functions, such as water temperature, water cleaning cycles (filtrations), lighting and water massage can be controlled with WiFi module and special application from anywhere in the world with iOS and Android smartphones. Optimum positions of the jets, the adjusting of jet strength and direction allow for maximum relaxation and enjoyment. Small water jets provide massage of even pressure for a certain small area. Medium-sized and big jets are rotating, providing circular intensive massage to an area of varying radius. With airscrews it is possible to increase or decrease the inclusion of air into water jets, and to change the water pressure with it. Thereby you can enjoy massages of varying intensity. 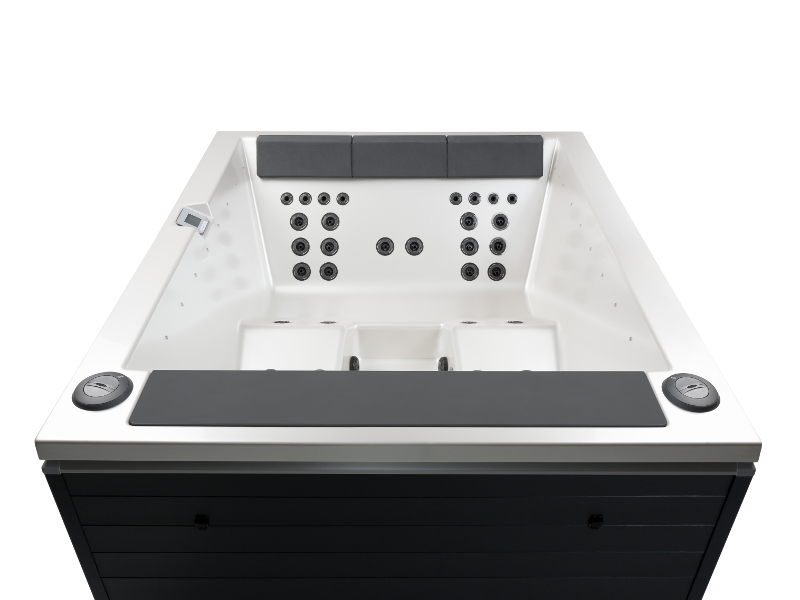 Lounge series outdoor spas feature flat water jets, intensity of which can be changed individually. To adjust the water flow simply turn the outer ring of the water jet. In order to increase the water pressure turn the ring clockwise, to reduce the water pressure turn it counterclockwise. Reducing pressure in one or more jets increases pressure in other jets. As a unique option, Wellspa Lounge series outdoor spas can be provided with additional jets for taller people. Wellspa is the only company in the world who offers this special option. The two hydraulic shock absorbers of the ergonomic lifting mechanism for the outdoor spa make lifting and closing the cover very easy and comfortable. 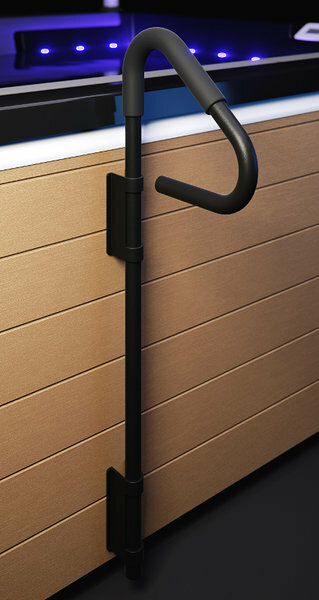 Padded handles on both sides of the lifting mechanism make lifting the cover comfortable. It is recommended to leave app. 40 cm (16 in.) free space behind the pool and 15 cm (6 in.) to the sides for the lifting mechanism. Additionally this staircase is also a design element. For a safe and comfortable use of the outdoor spa we recommend purchasing a padded handrail and a towel rack. It comes most handy in the winter. Chromotherapy or color therapy uses visible electromagnetic radiation spectrum aka color. Chromotherapy is a method in alternative medicine that uses colors and light to achieve a person’s physical, emotional, mental and psychic equilibrium. Every color possesses its own unique properties that have an effect on our body, senses and emotions. 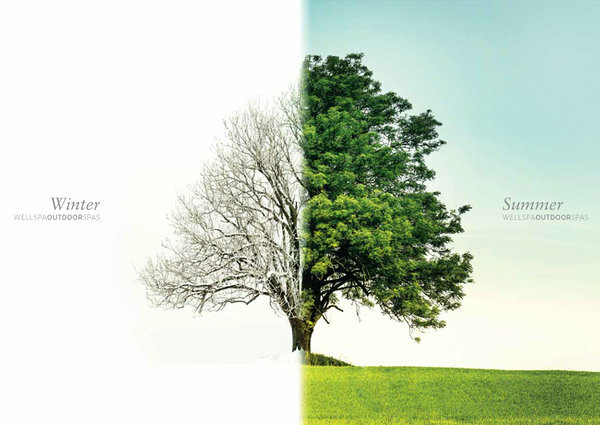 Exposure to different colors is used to improve our wellbeing. White – balances senses, helps to restore the inner rhythm of the body; stimulates the production of serotonin that helps to regulate sleep and nervous system. During the cleaning cycle, ozone (O3) ensures the cleanliness of the pool water by destroying the bacteria, while any smaller dirt particles are removed by using paper filters. The filter system automatically completes four filtering cycles per day. At any other time, the pumps operate at a low speed, ensuring that the water is clean, all the while maintaining low energy consumption. 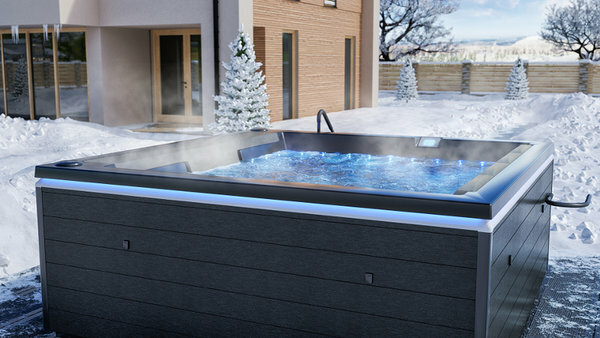 Our outdoor spas have been designed specifically for the challenging Scandinavian weather conditions. The most important features here are the extra strong construction, highly efficient thermal insulation and weatherproofness. 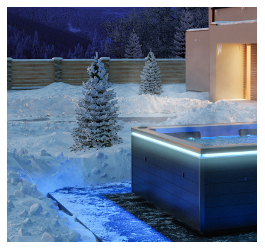 We have tested our spas very thoroughly to ensure their long and trouble-free use all year round in diverse weather conditions. For the highly efficient thermal insulation of the Lounge spa cabinets we use Kingspan 6 cm (2.36 in.) foam plastic insulation panels that are covered with insulation reflective surfaces. All Wellspa outdoor spas bottoms are built with unique three-layer construction. Thermoformed ABS-plastic lower and upper part, and 5 cm (2 in.) thermal insulation between them. The special construction of the bottom ensures complete hydro-insulation and maximum thermal insulation. In order to ensure maximum thermal insulation the standard delivery scope of the outdoor spas includes thick thermo-insulated cover. To ensure the durability and weatherproofness of the cover, it has an U-profile reinforcement frame built into its outer edges. To close it tight and with heat retention, the cover has 8 tightening straps. 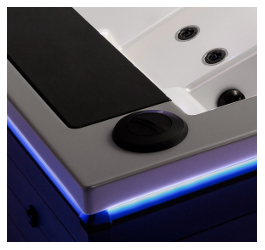 Wellspa spas are fitted with a special cover that has a strong aluminium-profile, ensuring safety for families with children. 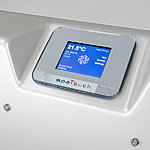 The pool control panel has a child safety lock that prevents access to the settings of water massage, heating and other functions. The heating system of the pool is programmed in a way that prevents the water temperature from dropping below 15C, keeping the water from freezing. 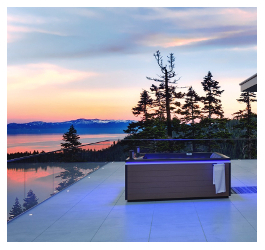 Lounge spas are exclusively built on strong galvanized steel frames – this is to guarantee a very rigid structure for many years of operation. Our engineers preferred steel framing to wood, composite or aluminium, since this is the best material offering maximum construction durability. Our new, smallest Lounge Spa is a perfect compact home spa. Its a perfect combination of modern design and relaxation. 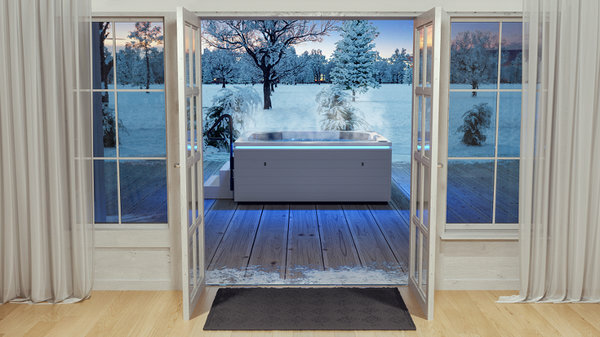 Come and see the new Outdoor Spa in our stand C-75 in Estonian Exhibition Center.